Ever wonder what the real cause of grey hairs is and how you can prevent or even reverse them? In 2009, researchers at the University of Bradford in the United Kingdom concluded that grey hairs are a result of oxidative stress caused by a buildup of too much hydrogen peroxide. Our body naturally produces hydrogen peroxide along with the enzyme catalase, which breaks the hydrogen peroxide down into water and oxygen. But as we age our catalase production drops, while the hydrogen peroxide remains, causing some people to go grey. New research published in The FASEB Journal supports these findings, and also found a link between grey hair and the rare skin pigmentation disease vitiligo. They did a study on vitiligo patients using a proprietary topical, UVB-activated cream with success, and believe that a similar product could also help with grey hair. Information on when this treatment will be developed and available to the public has yet to be released. But what if a natural remedy already exists? Studies show that ionized alkaline water from a water ionizer is effective against the breakdown of DNA caused by oxidative stress, and thus may be a great natural alternative to grey hairs. The health benefits expressed by ionized alkaline water drinkers is vast. Users report everything from more energy to better sleep to a more youthful looking appearance, including in some cases the reversal of grey hair. Chanson water ionizers are backed by a lifetime warranty and include a generous 60 day return policy. They provide healthy ionized alkaline water for drinking and eco-friendly ionized acidic water for cleaning and beauty purposes. This investment can pay for itself in 2-3 years based on the amount of money you can save on bottled water, cleaning and beauty products. Financing is available for as low as $25 a month on approved credit. DISCLAIMER: The FDA prevents any natural health company from claiming that their product will treat, cure or prevent a disease, and your individual experience may vary. Have you tried cultivating your own blossoms only to have them die, or attempted to grow your own produce but lost it to hungry bugs? 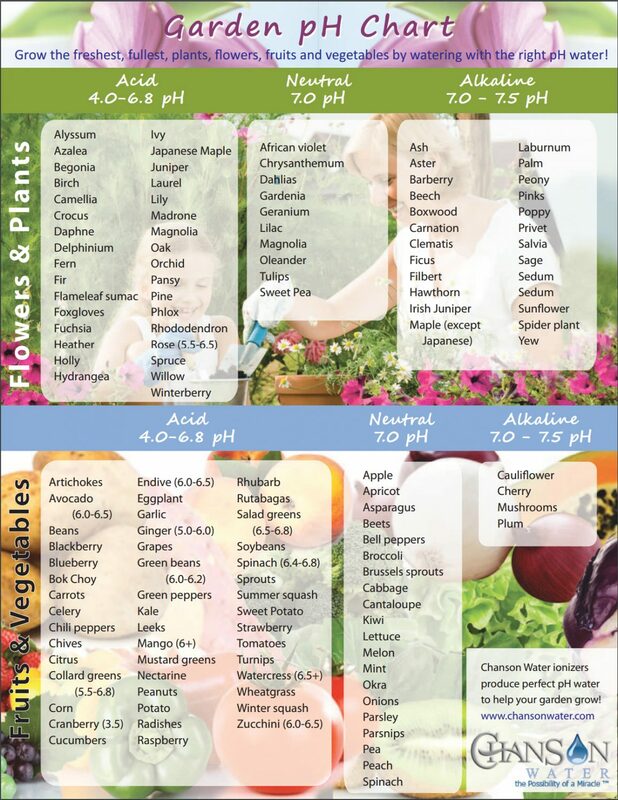 Gardening is hard work, and the pH balance of the plant water and soil plays a large role in whether or not your efforts are successful. Unlike humans, plants “breathe out” oxygen and “breathe in” carbon dioxide. While humans thrive on clean, ionized alkaline water, most plants like to drink ionized acid water, as shown in this gradeschool science experiment. Plus, most insects are repelled by ionized acidic water, making it an all natural pesticide. Most rainwater has a pH of 5.6-5.8 due to the presence of carbonic acid (H2CO3). This means it is moderately acidic, but should not be confused with acid rain which hovers closer to 3.0 pH due to emissions of sulfur dioxide and nitrogen oxides mixing with the water molecules. Many commercial fertilizers are ammonia-based in order to increase soil acidity, but the water that comes out of your sprinklers and garden hose is likely neutral or slightly alkaline and filled with chemicals like chlorine, chloramines and fluoride which can be harmful to plants. When it’s time to cut your blossoms to give away or display around the house, most cut flower stems should be watered with ionized alkaline water since, like us, they have been uprooted from their original life force and are slowly dying. And when you’re ready to eat the produce you have grown, we recommend spritzing it with strong ionized acidic water to naturally kill any bacteria that has grown on them. Then you can soak the produce in 8.5 pH ionized alkaline water for 10 minutes directly before consuming in order to revive the produce to it’s freshly picked state. You’ll have the freshest, best-tasting organic produce on the block!